For a split second we get to relax… although Rett Syndrome does not go away, we feel that we’ve got our little girl back, the anti-seizure medication change seems to have been a success, there haven’t been any seizures in almost 2 months, she’s not tired and irritable anymore, she’s back…with enthusiasm for life…everyone around her notices the change….we relax…revelling in the huge success of our big event and the support and donations that keep coming….we relax….endless dinner table conversations about the event, Elle still so excited about the event and about having dropped the puck…we relax….a case conference with all her service providers, everyone so excited about the news, she’s doing so well, plans are on track…we relax….she’s lost her first tooth and the tooth fairy came and left her money – she couldn’t have been more excited….we relax….our little girl is growing up and we’ve survived another one of life’s milestones….we relax…. But then….Rett Syndrome hits us again and now what seemed like an exciting life milestone proves to be a trigger for seizure activity. Who knew that cutting your adult teeth could be a trigger for seizures…again our little girl is taken away from us…15 seizures in a 36 hours period…exhausted, irritable and clumsy because the seizures cause paralysis which seems to take days to fully resolve. Then a week later just as she is getting back her balance and full mobility…they strike again!! Another 12 seizures in a 24 hour period. NO….. Rett Syndrome does not discriminate…it didn’t matter that it was Family Day weekend and that all Elle really wanted to do was to go practice her skating….again her hopes crushed, because her legs were just not strong enough to walk, let alone skate…our little girl left disappointed, frustrated, irritable…not understanding why the seizures had to come back and we are left wondering why once again our enthusiastic, full of life little girl has once again disappeared. It’s been just over a month since Elle was diagnosed with Rett Syndrome and it’s interesting that although she is still the same kid that she was on October 25th , it feels like so much about our lives has changed. When we received this diagnosis our hearts were filled with grief and sadness – that although our daughter was still here, we had lost the dreams of what she may one day become and of having that so called “normal” life. I have to be completely honest that during the first few weeks, both Lory and I shed a lot of tears. More tears that I ever imagined were possible and at the most random times over what most people would consider insignificance events. I cried alone in my car driving home from work, I cried in Lory’s arms and I cried watching a comedy as a father walked his daughter down the aisle, something that I will probably never experience with Elle. Those tears turned to fear on November 21st, when Elle experience the most terrifying seizures that we have ever experienced with her. I cannot tell you how terrifying it is to watch your little girl have a seizure that lasts over 8 minutes as you are comforting her and calling 911 at the same time. Those were the longest 8 minutes of my life because I felt completely helpless. She experienced seizure after seizure for a total of 10 during the night and into the early morning. Not only does she have to endure the toll that the seizures take on her little body, but after the seizures she generally experiences full body paralysis which turns her body into a rag doll. In reading about Rett, they talk about periods of regression; not knowing if this was that time that she would not regain her ability to walk or use her body again was terrifying. Watching her a week following the seizures still struggling to get her body to do what she wanted it to and getting frustrated by this. Fortunately she eventually returned to her pre-seizure self, adapting to the medication change and just hoping that the anti-seizure medication helps to avoid another night spent in hospital, another day of not being able to use her body, another week of Lory and I being terrified about whether or not our little girl would be the same again. Then December 5th, it happens again…………. October 26, 2012, the day that my life got turned upside down….the day we heard those dreaded words – “she has tested positive for Rett Syndrome”. My wife, Lory, had taken our 5 year old daughter, Elle, for a routine visit with the Neurologist, to review her medication for the seizures that started to plague her in March, when she called me with the news. I’ll tell you, nothing in life can prepare you for a moment like that. The last 3 years of countless visits to various doctors; from pediatricians to developmental pediatricians, neurologists and a metabolic geneticist, all unable to give us an answer….a heart breaking journey of watching my daughter be poked and prodded. Finally an answer, although the answer that we dreaded. I have known for a while that Elle was ‘different’ and probably would not grow up to play hockey or have the ability to golf with me on Sunday mornings. As a father I was hoping to groom her to be the perfect little ‘tomboy’ that would be able to combine intelligence, beauty and athleticism and set the world on fire. It was for this reason, that it was so important for me to know the root cause of her delays. Many people have said “that it won’t change who she is” or “how much you love her” and they are right, but what it has done is change my perspective. As a father to two beautiful little girls, there is nothing in the world that I would not do to protect them, help them, nurture them and allow them to develop into amazing women. Now we know what we are dealing with, we know the traits of the syndrome, we know what type of specific care to pursue and we know with Rett Syndrome that there is no known cure, but the researchers are making significant progress. They say that everything in life happens for a reason and I truly believe that more than ever now. From the way that Lory and I met and end up together, to the decision not to pursue an opportunity to referee a semi-professional hockey league and to complete a MBA and start a family instead, to the struggles conceiving our second child while exploring so many possibilities with Elle, to the timing of welcoming Paige into this world and now October 26, 2012, the day before Lory returns to work after maternity leave. A hockey coach once said that great moments are born from great opportunity. I believe that this is my great opportunity and it is time to make a great moment. It is my time to ‘Cowboy Up’ and do some thing positive and try to make a difference in the lives of many families and individuals that are affected by Rett Syndrome. Although, I had never heard of Rett Syndrome until we tested for it, it now occupies my every waking minute and I want to do my part to find a cure. It is time for ‘Ref4Rett’. 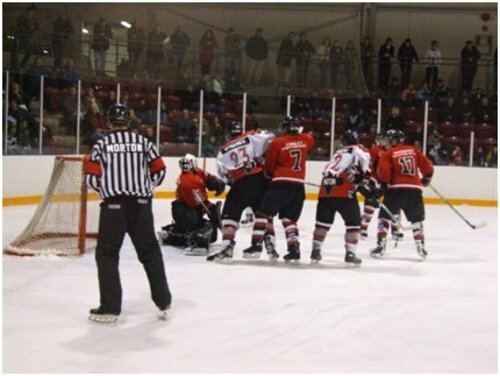 I have been an amateur referee for more that half my life with the OMHA and the OHA and it truly is like a brotherhood. Officiating has provided me with a lot of great moments; great games and I have met a lot of great people. It is different that being a player who goes from one team to another, different than a coach who has new players every year. We have all had ‘bad games’ or challenges during our hockey career, but these are nothing like the challenges that Elle will likely experience in every day life. I am making a commitment to donate $20 for every game that I officiate for the rest of my career to Rett Syndrome and specifically Ontario Rett Syndrome Association. I am hoping that as officials, as a hockey fan, a parent or even a compassionate person, that you will help me in supporting this cause that is so near and dear to my heart. There is a quote that I have read and it brings me to tears every time I even think about it.